The Texas A&M Engineering Experiment Station’s (TEES) Gas and Fuels Research Center (GFRC) and the Texas A&M Energy Institute (TAMEI), a joint institute between Texas A&M University and the Texas A&M Engineering Experiment Station, recently pledged to work together to advance research, education, and training in Qatar – particularly to in the area of shale gas and natural gas exploration, production, and monetization activities both in Qatar and the United States. With common interests in the pursuit of the advancement of knowledge and science related to energy-related and energy-intensive processes, systems, and opportunities, TAMEI and GFRC’s objectives are well-aligned, complementary, and stand to provide mutual benefits to Qatar and the Middle East, along with Texas A&M University, the Texas A&M Engineering Experiment Station, the Texas A&M University System, the state of Texas, and the broader community. While in Qatar, representatives also hosted an Open House for the Master of Science in Energy program, which is available face-to-face in College Station, TX, fully by distance anywhere in the world, and is also available with a research thesis supervised by faculty members at Texas A&M University in College Station, TX or in collaboration with faculty members from Texas A&M University in Qatar. The Texas A&M Energy Institute engages undergraduate and graduate students, postdoctoral associates, research staff, and faculty members toward the study and development of innovative technologies and policies for energy production and energy conservation. Special attention is paid to elucidating the complexity among the interacting components of energy, economics, law, public policy, and the environment. With 280 faculty affiliates from nine colleges and schools, more than 20 Texas A&M University departments, two Texas A&M University branch campuses, and two Texas A&M University System member institutions, along with a unique community of more than 450 doctoral students and postdoctoral fellows in the Texas A&M Energy Research Society, cutting-edge solutions are being realized through true interdisciplinary collaborations that will address the complexity and challenges of the world’s energy future. 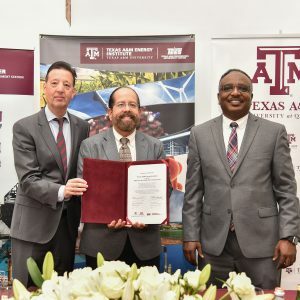 The TEES GFRC is a multidisciplinary research center that is led by Texas A&M University at Qatar and involves 22 professors from the Qatar campus and Texas A&M University’s main campus in College Station. The center draws on experience from different engineering programs including chemical engineering, petroleum engineering, material engineering, and mechanical engineering.